Recipe and picture copyright Dairy Farmers of Wisconsin. Make tzatziki sauce: Grate cucumber on large holes of box grater; place in bowl. Add 1 clove minced garlic, Greek yogurt, honey, cayenne, and a pinch of salt. Mix well and refrigerate until serving time. Make olive tapenade: Process olives, capers, parsley, remaining clove minced garlic, and anchovy fillet in food processor bowl with 4 tablespoons olive oil; process until smooth. Refrigerate until needed. Slice eggplant(s) into 1/4- to 1/2-inch slices. Drizzle with olive oil and season with salt and pepper. Heat outdoor grill or stovetop griddle and grill eggplant slices for about 2 minutes a side. Set aside. Keep grill or griddle hot. 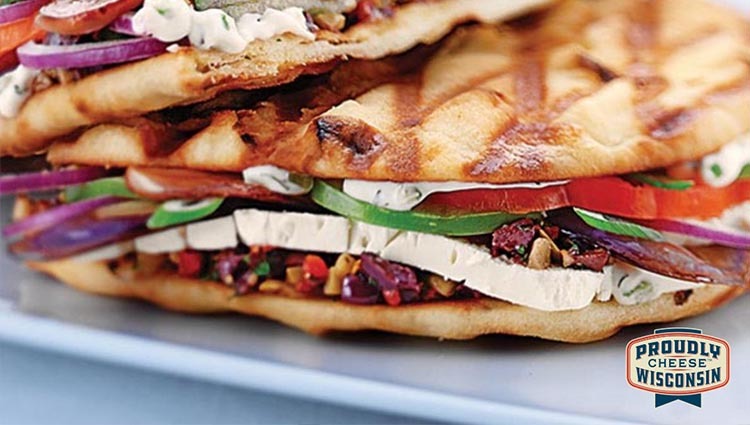 Cut flatbread pieces in half and place about 1 tablespoon of olive tapenade on each of 4 halves. Top with 1 ounce Feta, some tomato slices, onion slices, eggplant slices, another ounce of Feta, and flatbread half. Drizzle sandwich tops with a little olive oil and place, oil-side down, on hot grill. Grill about 3 minutes, then drizzle with a little more olive oil and flip. Grill until flatbread browns and cheese is heated through. Serve with tzatziki sauce on the side.